Ma’at was the goddess of truth, justice, balance, and most importantly - order. In paintings, she was depicted as a woman who is either sitting or standing with an ostrich feather on her head and, in some cases, she was depicted with wings. According to the creation myths, Ma’at was created when Ra arose from the waters of Nun (chaos). Ma’at was often considered to be the daughter of Ra and was married to Thoth, god of wisdom. However, Ma’at was more than just a goddess to the ancient Egyptians. She represented the crucial concept of how the universe was maintained. The ancient Egyptians believed the universe had an order to it, and it was Ma’at who kept everything in balance. This helped the ancient Egyptians develop a strong sense of morality and justice. Ma’at was extremely important in achieving the Afterlife. According to Ancient Egyptian mythology, after the death of the body, everyone had to pass through the Hall of Judgment, where a person’s heart was weighed on a scale against Ma’at’s feather of truth. If the deceased person’s heart balanced with Ma’at’s feather, they could continue their journey to the Afterlife. If not, their journey ended. This influenced the daily actions of the ancient Egyptians. 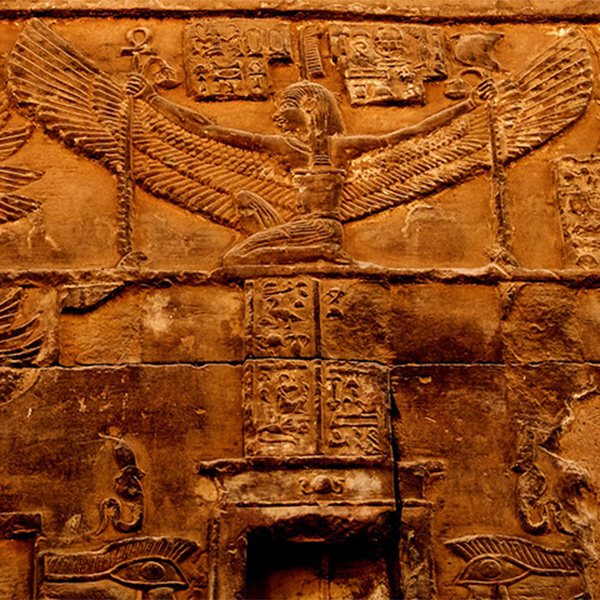 Image: The deity Ma’at, in winged form, is seen on the side of the Temple of Sobek, Egypt. Taken by flickr user Carlos Bustamante.